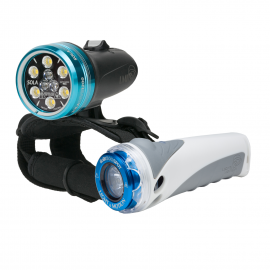 A powerful two-punch, this light combo provides divers with an innovative primary and secondary setup. 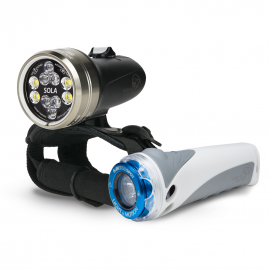 The Sola’s versatile spot/flood beam is perfect for any dive condition and the GoBe’s compact design still outshines many primary torches. 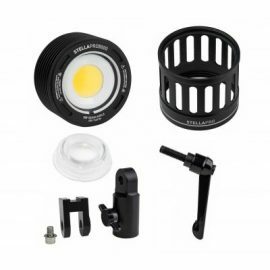 The 5000 Lumen Air Kit provides an interchangeable light head for the Sola Video Pro 9600. 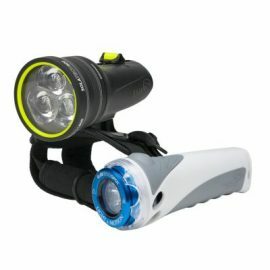 Allowing the system to run above the surface at 5000 lumens for 90 minutes, the kit reinvents the capabilities of professional underwater imaging lights. The light head supports all the in air modifiers of the Stella Pro and allows the light to run directly off of wall power for extended shoots. The 7000 Lumen Air Kit provides an interchangeable light head for the Sola Video Pro 9600. 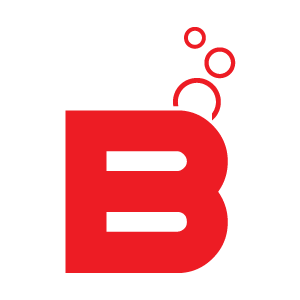 Allowing the system to run above the surface at 7000 lumens for 60 minutes, the kit reinvents the capabilities of professional underwater imaging lights. The light head supports all the in air modifiers of the Stella Pro and allows the light to run directly off of wall power for extended shoots. A powerful two-punch, this light combo provides technical divers with an innovative primary and secondary setup. Featuring tight 8 degree beam patterns and extra long runtimes, the kit features the Sola Tech 600 with a 3 hour burn time on high, whereas the backup GoBe still illuminates 1.5 hours on high. 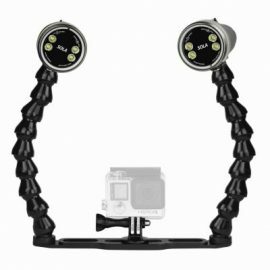 Jumpstart your SOLA system with the Sola Video 2000 Action Kit Double, a powerful kit for all your underwater adventures. Sola Video lights are the most compact and brightest lights in their class, providing photo and video enthusiasts with power and flexibility in a small package. The Sola Video 2000 Flood has an extraordinarily smooth 60 degree beam pattern.